Run 1 mile each day…. sounds easy right? Well myself and another mother runner have challenged our local Moms Run This Town group to a Holiday Running Streak. While we know 1 mile everyday may be easy for some others may have a hard time carving out the time to get it done so we have given a few modifications to help get everyone moving this holiday season. The goal is to run or walk 1 mile per day. If that 1 mile is not possible then you can do 3 the following day to make up. If you miss 2 days in a row you owe 6 miles. 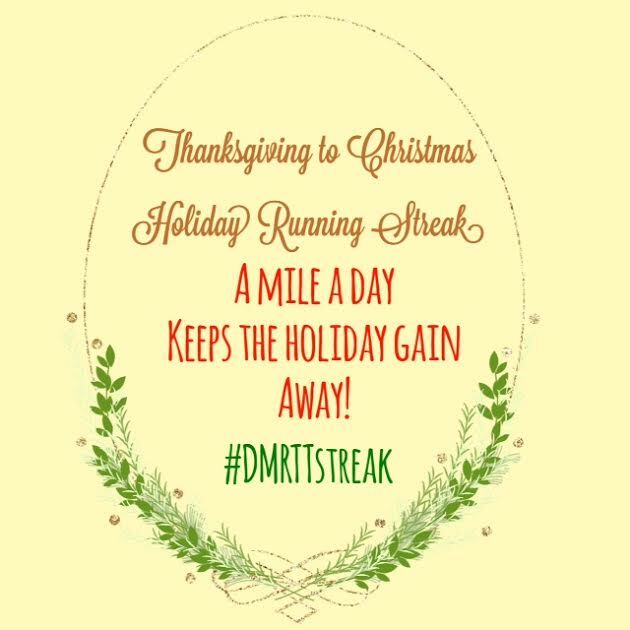 While our challenge runs from Thanksgiving to Christmas, we plan to challenge our mother runners even more and extend it until New Years! We have collected some prizes that will be randomly given to participants and I wanted to give our sponsors a shout out! These ladies are awesome. Be sure to check them out- they have the best advice, great books, and literally are in the “know” about all things running related! I was lucky enough to win a few sparkly soul headbands and I want to share the love! One of our lucky mother runners will be getting a thin sparkly soul headband!! Our mother runner and fitness instruction Amy has secured some month visitor passes for a few lucky participant’s. No excuses this new year!! We are now more than half way through our running streak and as I reflect I wonder.. what other kind of fitness challenges or streaks would you like to see in the future? Would you still participate even if there were no prizes at stake? I cannot tell you how proud I am of the runners in our group. We keep each other accountable through a facebook group and I must admit- their dedication has kept me on track. As we approach a new year I hope you all find some kind of group or challenge to keep you accountable! A great series I love to jump in on is Mommy Run Fast 5 by the 5th virtual series! Laura does a great job of getting others up and moving! Here is to a successful end to 2014 and an even better 2015!